Rain gauges are essential in collecting data on precipitation an area receives over a period of time. This information is used by scientists to track biodiversity and develop advanced meteorological instruments aiding notably in aviation. However, rain gauge performance can be severely impaired in regions where extreme cold weather dominates. In fact, a leading manufacturer of aviation technology solutions approached BCE to develop a means to heat their tipping bucket rain gauges in regions impacted by heavy snowfall and freezing rain. In order, for these rain gauges to remain operational, precipitation needed to be melted in the collection funnel, then remain fluid inside the gauge and finally drain with ease after the data had been collected without freezing with exposure to the outside air. BCE proposed foil heaters to heat the collection funnel and the inside of the gauge. These heaters were precisely manufactured to achieve the perfect form and fit needed for the rain gauge components. Not only did they match the exact electrical specifications, the resistance element laminated between aluminum foil shells provided optimal surface heating. 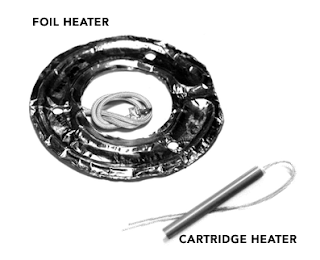 Furthermore, each of the foil heaters were also embedded with thermostats for accurate temperature control. For the drain tubes, BCE manufactured cartridge heaters to the desired length and with a robust stainless steel sheath providing continuous operation. These cartridge heaters further ensured maximum heat transfer through the close proximity of the element wire and sheath. This also allowed minimal internal temperatures in the cartridge heaters increasing heater life and preserving excellent dielectric strength, two essential criteria for this application. BCE’s contribution proved to be a huge success in the design and operability of these tipping bucket rain gauges. Contact BCE for any electric heating design or application. You'll be pleased with BCE's experience, knowledge, and service. Visit them at http://belilove.com or call (510) 274-1990. Download the PDF Application Note here.